What is the purpose of a dexamethasone suppression test? wo tests use dexamethasone (a synthetic cortisol) for diagnosing Cushing's disease or Cushing's syndrome. They are the "LOW DOSE" and the "HIGH DOSE" dexamethasone suppression test. The low dose dexamethasone suppression test can be used to screen for the presence of hyperadrenocorticism (Cushing's disease) and in many cases, it will differentiate the type of Cushing's disease that is present. The high dose dexamethasone test is used when the patient has been confirmed with Cushing's disease by means of the low dose test, but the low dose test has not clearly differentiated the type of Cushing's disease that is present. Both the low dose and the high dose dexamethasone suppression tests take 8 hours to complete and involve three blood samples. The first sample is taken prior to the injection of dexamethasone, and the second and third samples are taken at 4 and 8 hours following the dexamethasone injection. The difference between the two tests is in the amount of dexamethasone that is injected. The two tests must be run on different days. What is the basis of the dexamethasone suppression tests? The paired adrenal glands produce and store cortisol (also called cortisone). Normally, cortisol is released from the adrenal glands in times of stress, and enables the body to respond rapidly and appropriately to the stress. With Cushing's syndrome, an excessive amount of cortisol is circulating all the time. "...controlling mechanism called a negative feedback loop." In a healthy dog, ACTH (adrenocorticotropic hormone) is secreted by the pituitary gland and stimulates the adrenal glands to produce or secrete cortisol. 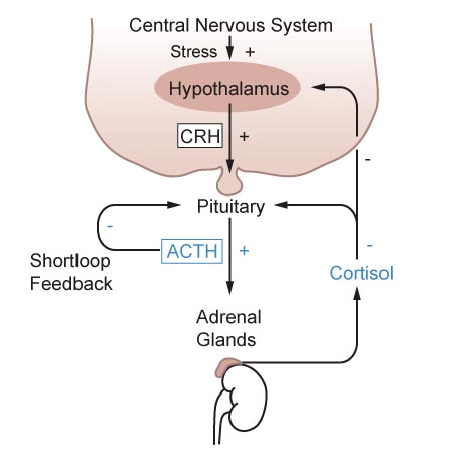 As the blood cortisol level increases, it causes the pituitary gland to lower its production of ACTH, which results in a lowering of the blood cortisol level - a controlling mechanism called anegative feedback loop. This feedback loop is capable of causing rapid changes in blood cortisol levels in response to the body's needs. However, in a pet with Cushing's syndrome, this controlling mechanism is not working correctly. The dexamethasone suppression tests exploit the negative feedback mechanism in order to diagnose the presence of Cushing's disease. When healthy dogs are given an injection of synthetic cortisol (dexamethasone) the level of ACTH is suppressed, causing a decrease in cortisol levels in the blood for a period of time. 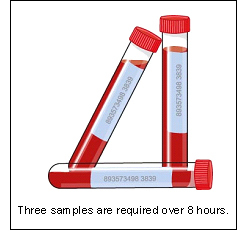 Blood samples are taken at timed intervals following dexamethasone injection, and the amount of cortisol in each of the samples is measured and compared. What sort of result will a dog with Cushing's disease have? With Cushing's disease, the negative feedback loop is diminished or lost. This is due to either excess secretion of ACTH by the pituitary gland because of a tumor, or due to excess production of cortisol by the adrenal glands, also often related to a tumor. 'With Cushing's disease, the negative feedback loop is diminished or lost." With the pituitary type of Cushing's disease, a SMALL AMOUNT of suppression in cortisol production may occur in the 4 or 8-hour blood samples. This is because some of the natural negative feedback mechanism usually remains. With Cushing's disease that is caused by adrenal disease, NO reduction in blood cortisol concentrations will be noted in the 4 or 8-hour samples. This is because the negative feedback loop is lost completely. Will the LOW DOSE dexamethasone test always allow diagnosis of Cushing's disease? No. In most instances, the low dose dexamethasone suppression test will allow the diagnosis of Cushing's disease to be made and also give an indication of the type of Cushing's disease (pituitary gland versus adrenal gland origin). When is it necessary to perform the HIGH DOSE dexamethasone test? Occasionally with the pituitary form of Cushing's disease, there is no suppression of the cortisol blood levels (because the negative feedback loop is more resistant to the effects of the synthetic cortisol). A higher dosage of dexamethasone (high dose dexamethasone suppression test) may therefore be required to overcome this resistance and demonstrate the negative feedback mechanism. Cushing's disease caused by an adrenal gland tumor is resistant to the effects of both low and high doses of dexamethasone. Therefore, failure of blood cortisol levels to decrease after using both the low and high doses of dexamethasone is supportive of an adrenal origin to the Cushing's disease. In summary, if we get a reduction in cortisol levels at 4 and/or 8 hours after either dose of dexamethasone, then we have diagnosed pituitary origin Cushing's disease. If the levels don't budge from the high values of the pre-injection sample, then the diagnosis is adrenal origin. Are there any other reasons why cortisol levels may fail to suppress? Yes. While a lack of suppression to dexamethasone injection is supportive of hyperadrenocorticism (Cushing's disease), animals with chronic medical conditions and those in other stressful situations may also fail to suppress. Therefore, it is important that other medical conditions be ruled out by blood screening tests and that the patient shows strong supportive clinical signs consistent with Cushing's disease before we undertake dexamethasone suppression testing. Why does it matter which type of Cushing's disease the pet has? "If the pet has pituitary dependent Cushing's disease the treatment is different than it would be if the pet has adrenal origin Cushing's disease." If the pet has pituitary dependent Cushing's disease the treatment is different than it would be if the pet has adrenal origin Cushing's disease. Cushing's disease caused by an enlarged adrenal gland may be treated surgically or medically. Adrenal tumors may be malignant or benign. Pituitary tumors that cause Cushing's disease are usually benign, and their treatment is medical.